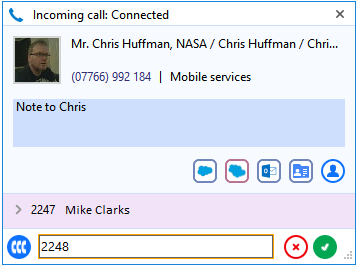 The conference feature allows three parties to simultaneously be in the same call. To set up a conference call follow the steps below. You are then presented with a box at the bottom of the window. When you are ready, type the number you wish to conference with and click the "green tick" button. This will place a call to the number while placing the original call on hold. 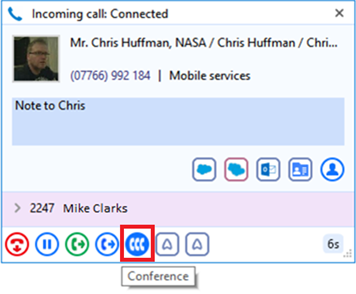 Then press the "Conference" button to join all parties in the call. With the call in place press the "Conference" button to bring all parties of the conference into the call, together. When the numbers are in the conference state the calls are stacked to reduce the size of the display. To finish the conference press the Hang up button. Note: Some versions of Go Integrator do show the conference button, or your system may not be set up to support this feature.